Kristen Radsliff Rebmann is an Associate Professor at the School of Library and Information Science at San Jose State University. Kristen Rebmann's research focuses on learning design, new literacies, and distance education/librarianship. 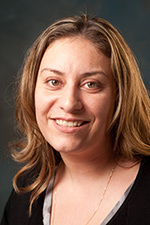 Via ethnographic and other qualitative methods, she seeks to answer questions about the ways in which individuals use information to learn and support their own development. Bound up in this agenda is the goal of designing environments and literacy events that are both intellectually transformative and engaging to participants. Several of Rebmann's projects engage in interdisciplinary conversations with the fields (and theoretical perspectives) of Library & Information Science, Communication, and Education.